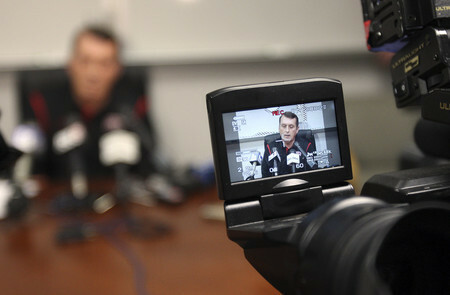 Mike Sanford insisted he wasn’t frustrated or bitter, that he simply wanted to set the record straight for the good of UNLV football. The fired coach blamed numerous factors for holding back the program, including a lack of community and university support as well as substandard facilities, but never mentioned himself as part of the problem. "This is not a coach issue," Sanford said in his news conference Monday at the Lied Athletic Complex. "This is a system, infrastructure, commitment issue that I am concerned about. "There’s been more of a football commitment made at Reno from a facility standpoint than there has at UNLV. Our locker room is the worst locker room in college football. "If people really want to win here, if they’re going to hold the football coach and the football coaching staff here to a high standard, they need to put their money where their mouth is. I don’t believe that’s ever been done here. I don’t believe it was done one bit during the time I was here." Koloskie disputed Sanford’s claim that the coach, whose salary is $425,000, wasn’t given enough backing to win. "I believe we have supported football," Koloskie said. "I think we have the resources in place for us to be successful. It was a performance-based decision. We just need to be better. I do believe we’re fully funded. We have the scholarships available." Sanford, 54, was fired Sunday, a day after the Rebels lost 45-17 at Air Force. UNLV is 4-7 this season and 15-43 in nearly five seasons under Sanford. The team is off this week. Sanford and his staff will coach the Nov. 28 season finale against San Diego State at Sam Boyd Stadium. Interim athletic director Jerry Koloskie said a search for a new coach will begin right away but that the hire will be made by the school’s next AD; the search committee to fill that post next meets Dec. 1. UNLV president Neal Smatresk said those applying to be athletic director should be "thinking about" who and what they want in a football coach. "If they don’t have a plan, I’d be pretty concerned about their foresight as an athletic director," Smatresk said. Koloskie said negotiations are taking place regarding Sanford’s buyout even though the coach is contractually owed $225,000 because the termination is technically after Dec. 4. Dismissing him before then would cost UNLV about $60,000 more. Most of UNLV’s veteran players weren’t surprised by his firing. "You realize if things don’t go a certain way, certain things have to happen," quarterback Omar Clayton said. "(Sanford) is our head coach. Everyone sees him as our leader, so something had to happen. "I think either the president or the athletic director did what they needed to do." Contact reporter Mark Anderson at manderson@reviewjournal.com or 702-387-2914. 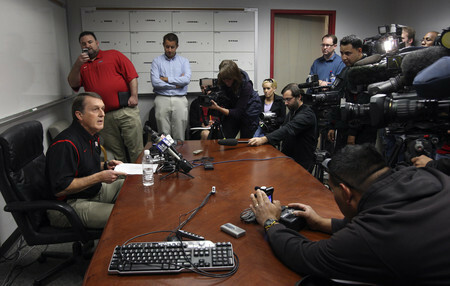 Read the latest UNLV football updates at lvrj.com/blogs/unlv_sports.